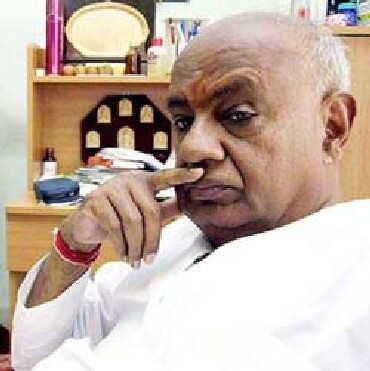 Former prime minister H D Deve Gowda on Saturday tried to downplay the controversy surrounding liquor baron Vijay Mallya in connection with the money laundering case. “Vijay Mallya as a person was born in Karnataka and is from a reputed family. Subsequently in business there may be some areas of mistakes and the matter has been subsequently discussed in Lok Sabha and Rajya Sabha,” Gowda told the media persons in Bengaluru. “There was no reason to target an international businessman like Mallya,” he added. After writing to Prime Minister Narendra Modi seeking his intervention in safeguarding their interest, employees of Vijay Mallya's now defunct Kingfisher Airlines are set to file a case in the Supreme Court in order to get their dues from the company. The employees are in touch with senior lawyer M V Kini to put their case before the apex court and they have been assured by him that their case will be fought pro bono, given their financial condition. Earlier on Saturday, Kingfisher employees in their letter to the prime minister, highlighted their humanitarian plight as they have not been paid their dues including salaries and statutory dues like the Provident Fund and Gratuity, adding that they are also being hounded by Income Tax notices although the tax default is from the side of the airlines. “Our present laws which were supposed to protect the employee's interest have become redundant and are failing to solve the purpose that they were meant to serve. The best example would be that some of our colleagues who could afford legal fees went to courts and were awarded decrees in their favour even after which it did not translate into actual dues, thereby making a mockery of our justice system. Others are still fighting for their dues in the winding up petitions in the Hon'ble Karnataka high court,” the letter said. The government had earlier told the Supreme Court that Mallya had left India on March 2 following which the bench issued notice to him and sought his response within two weeks on pleas filed by a consortium of banks seeking direction for freezing his passport and his presence before the apex court. In a series of tweets on Friday, Mallya said that he was not an absconder and was not fleeing from India adding that he firmly believes the law of the land.